Hi Kim Six Readers!! We are so excited to be back here visiting with you today. If you can tell, from our previous posts, we love a good upcycle. What's not to love? Take something that is lifeless and bring it back to life. It's probably how a heart surgeon feels.....ha! As we end 2016 we say goodbye to some pretty fabulous calendars. Really, people are paid to make these. They are artists for goodness sakes. You say you don't buy a calendar? No worries, you can reuse the front of greeting/Christmas cards you receive. Q. Why make your own cards? A. Well, not only are you avoiding waste but has anyone seen the price of cards? YIKES! Tight budget or not, cards can really add up. If you send out 55 cards a year (average) X $3 (average) = $165 a year. We can make them WAY cheaper and with less to throw away. *Affiliate links used to show like or similar type items. You can read our full Disclosure Policy here. *Most of us crafters have quite a supply of items that you can use making purchasing items very minimum. Would highly recommend a glue runner for this project though ...if you don't already use. Now, take your calendar/card and cut out any designs that you like. Think about those pretty boarders. Pictures on dates. Basically anything you can use again. Take a blank greeting card that you can find at any craft supply store or HERE. Make sure you pick a color theme. Are you doing a red and green card or a snowflake card? Pick one special piece or focal point and build around that. Don't glue anything do right off the gate. Play around with a mock design for awhile to see how you like it. Layer! If you want the card to have a special quality to it, get some layers and even look at different patterns. If you are super "fancy", you can stamp your name on the back......designed by. 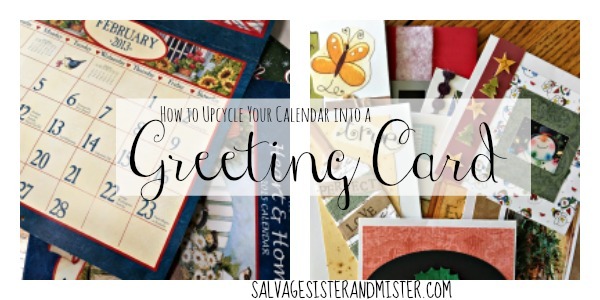 Since a calendar has many different seasons, it's easy to make a card for each one. You can then tie them all together and give as a gift or use them yourself. Now that you are ready to start making your own cards, look over your Christmas card stash and see if you can use any of it before it's recycled. If you would like to learn more about salvaging time, money, resources, and moments for your best life, we would love to visit Salvage Sister & Mister.